I currently work as a mediator/arbitrator in Ontario. These services are offered through a company I own. Are these services that I provide insured under the primary LSO program POLICY? Coverage is available under the primary LSO program POLICY for a LAWYER’S mediation and arbitration services if those services fall within the definition of “PROFESSIONAL SERVICES” under the POLICY (i.e. the services arise from the LAWYER being responsible as a LAWYER). If you are not being retained because of your current or former law practice, you may wish to look into getting dedicated liability insurance for your mediation/arbitration services. This LSO Program coverage is available whether or not the PROFESSIONAL SERVICES are provided through the LAW FIRM itself or through a separate corporation. In the latter case, the LAWYER would be covered for the mediation and arbitration services which the LAWYER provides for the corporate entity. The corporate entity itself, however, would not be an INSURED under the POLICY, so would not actually be covered. The bar is encouraged to do more pro bono work. What are the insurance implications of this? The implications depend on the type of pro bono program through which these services are provided, as well as your current insurance status under the primary LSO program with LAWPRO. See our page on pro bono coverage for a full explanation. I am a PRACTISING LAWYER who represents both Canadian and U.S. clients from my Ontario office and I practice both Canadian and U.S. law. Does the LSO Program POLICY insure me for my practice of Canadian and U.S. law? The POLICY insures you for the practice of Canadian law only, and you would not be covered with respect to your U.S. practice. For more on this, see the definition of “PROFESSIONAL SERVICES” under the POLICY. As well, to the extent that you perform PROFESSIONAL SERVICES outside of Canada, you should be aware that the territorial provisions may limit the coverage available to you under the POLICY based on where you were when you provided the services, how much of your practice is provided outside of Canada and where the litigation takes place. For more on this, see Section “A. Territory” of Part II Special Provisions of the POLICY. I am practising in Ontario and thinking about entering into a commercial relationship with a foreign lawyer who would perform legal work for my clients on U.S. legal matters. I would be invoicing my clients for these services on my firm letterhead. What coverage is available to me under the primary LSO program POLICY should I or my LAW FIRM be named in a CLAIM that arises with respect to these services? You can expect that no coverage would be available to you or your LAW FIRM under the POLICY in the event that you or your firm is sued in respect of the U.S. legal services, nor would the U.S. lawyer or law firm be an INSURED or afforded any coverage under the POLICY. For clarity, the POLICY insures you for the practice of Canadian law only. For more on this, see the definition of PROFESSIONAL SERVICES under Part V of the POLICY. We strongly recommend that you approach the commercial market to obtain coverage for services you provide with respect to foreign law. Your general insurance broker may be of some assistance to you in that regard. If you are considering working closely with a foreign lawyer or even simply making referrals to one, LAWPRO has a number of resources to help you mitigate your risks, including articles on coverage with respect to foreign laws and lawyers and cross-border selection of lawyers. I am an Ontario LAWYER working in the U.S. and practising Ontario law for Canadian and American clients. About 50 per cent of my practice is devoted to serving my American clients. I currently carry the practice coverage under the primary LSO program. What protection would I have under the POLICY if a CLAIM were to arise out of this work? b. the CLAIM or CIVIL SUIT brought in relation thereto is made in Canada, and the issues thereon, including liability and DAMAGES are adjudicated on their merits in Canada pursuant to the laws of Canada, its provinces and territories, by a court in Canada. If you perform and docket more than ten per cent (10%) of your PROFESSIONAL SERVICES outside of Canada, we would recommend that you make inquiry of your insurance broker or other insurance professional. It may be that more comprehensive coverage for your practice of Ontario law in the U.S. may be available to you by commercial markets in the U.S. or Canada. Although you may choose to continue to purchase the practice coverage under the primary LSO program for what protection it may afford, it is likely that you would be eligible for exemption a) under the program on the basis that you are not practising law in Ontario. As part of my practice, I do a lot of patent and trademark work, both in Canada and the U.S. Am I insured under the primary LSO program for this work? The POLICY insures you for the Canadian patent and trademark work that you do as a LAWYER. It does not insure you for the practice of foreign law, so to the extent that you are conducting any U.S. patent or trademark work, no coverage would be available to you. For more on this, see the definition of “PROFESSIONAL SERVICES” in Part V of the POLICY. In the circumstances, we would recommend that you make inquiry of your insurance broker or other insurance professional for these potentially uninsured exposures. Coverage for such may be available to you through commercial markets in the U.S. or Canada. A PRACTISING LAWYER at our LAW FIRM passed away suddenly. What happens to that former LAWYER’S coverage under the primary LSO program? Upon receipt of written confirmation of the LAWYER’S passing, LAWPRO will cancel the deceased LAWYER’S practice coverage under the primary LSO liability program. 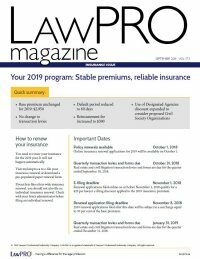 Recognizing that it takes time for an estate representative to consider the potential impact of future CLAIMS and possible need for on-going insurance coverage, LAWPRO provides a limited period of Increased Run-Off protection in the amount of $1 million per CLAIM / $2 million in the aggregate, at no cost. This coverage expires 90 days after the date of death. This limit is eroded by indemnity payments as well as CLAIM expenses and costs of repairs. As well, it is subject to a $5,000 DEDUCTIBLE per CLAIM and is reduced by any other CLAIMS for which notice has been provided by or on behalf of the deceased LAWYER while exempt in the past. We encourage you to read the “Insurance Matters for Retired Lawyers” booklet. It provides further details regarding the standard Run-Off Coverage, and will guide you in assessing the insurance options and amount that is appropriate and available for the estate. I own a one-third interest in a business corporation that is unrelated to my practice. The corporation has put my LAW FIRM on notice that it is making a CLAIM against it in respect of PROFESSIONAL SERVICES that I provided. Is my coverage under the primary LSO program likely to be affected by my ownership interest in the corporation? As you are a part-owner, this would be captured under the related-entity exclusion which is included Under Part III “Exclusions To The INSURED’S Coverage” of the POLICY. This impacts CLAIMS where the INSURED and/or certain close parties (i.e. the INSURED’S spouse, LAW FIRM partner, the partner’s spouse) own in some way 10% or more of the claimant business corporation. Where the combined beneficial interest is greater than 10%, coverage in respect of the CLAIM would be limited on a proportional basis. In this case, the one-third ownership interest in the corporation would result in one-third of the value of the CLAIM being excluded from coverage. I am considering an offer to become a director of a corporation. Will my activities as a director be insured under the practice coverage that I maintain under the primary LSO program? No, the POLICY does not insure you for your work as a director. We would recommend that you make inquiry of your insurance broker or other insurance professional for this uninsured exposure. Directors & Officers (“D&O”) insurance is available through many markets in Canada and may be purchased by the corporation itself or by outside directors individually. For clarity, POLICY coverage is provided only for those services which you provide in your capacity as a LAWYER, and not as a director or in any other capacity. The POLICY affords coverage for PROFESSIONAL SERVICES, which is defined in Part V of the POLICY.